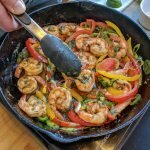 You’ll never waste your money on overpriced sizzling fajita platters again after you make this quick and easy Keto Tequila Lime Shrimp Fajitas. Perfect for weeknight tex mex dinners or low carb meal prep. Fajitas without the Tortillas??? Are you Mad?? 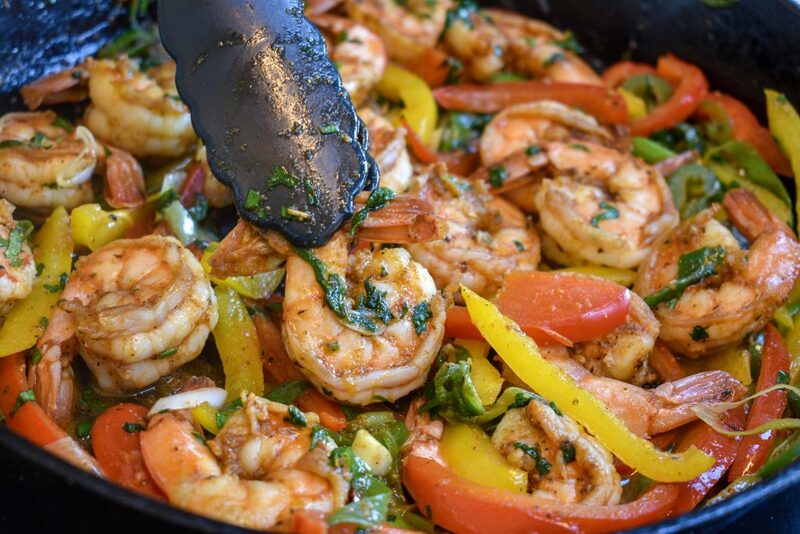 Yeah yeah, I know technically it’s not fajitas if there’s no tortillas but this dish is prepared using the same method and if you’re so inclined you can make any number of low carb tortilla recipes or just serve the shrimp over riced cauliflower. I’m familiar with a few store bought brands of low carb tortillas that do have some questionable ingredients but if they fit into your keto goals and lifestyle I don’t judge! 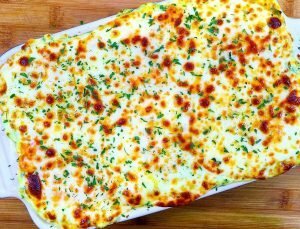 The spirit of this recipe is to provide you with a quick and easy dish full of fresh bright flavors that you can serve anyway you like. I love to make this when I’m looking for a quick bite and I can always meal prep the leftovers for lunch the next day. You’re going to over cook the shrimp adding the veggies at the end!!! Fear not, there is a method to my madness. If you’re like me every time I order fajitas from a restaurant the veggies are always mushy and the meat is greasy. 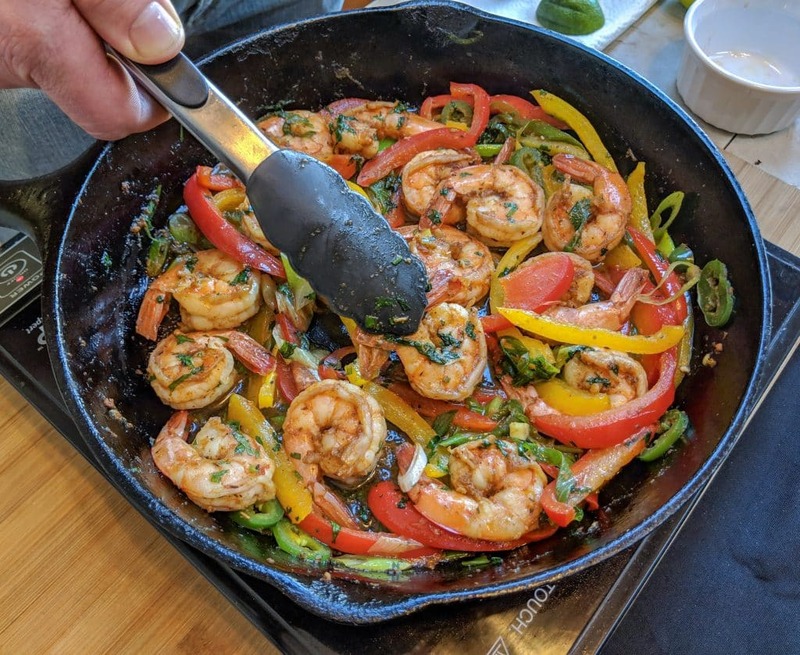 I prefer to sear the shrimp in a flaming hot cast iron skillet locking in the flavor and moisture of the shrimp and only cooking the veggies for a minute or two, just long enough so they are tender but still have a bite to them. Once the shrimp hit the pan the clock has started. You should have all other ingredients chopped and ready to add to the pan. So many times I see people cooking and chopping at the same time which tends to lead to rubbery shrimp and sad fajitas. As soon as the shrimp hit the pan spread them out so they are not touching and have even surface area to sear and develop a nice crust. You’ll want to flip them as soon as you see the sides of the shrimp start turning pink. After flipping the shrimp it’s time to add the raw veggies to the pan while the shrimp are searing on the second side. The veggies will immediately start to release moisture into the dish and once you add the tequila and lime juice the shrimp and veggies should be just about done. At this point I actually turn off the heat and add my herbs and scallions using the residual heat of the pan to finish off the dish. As an optional but very delicious final step I like to add one extra tablespoon of butter to bring the sauce together. Adding the butter while the shrimp are still cooking will give you a greasy unpleasant look but if you turn off the heat and gently fold in the butter it will coat the shrimp and combine with the natural juices to give you a beautiful velvety sauce. 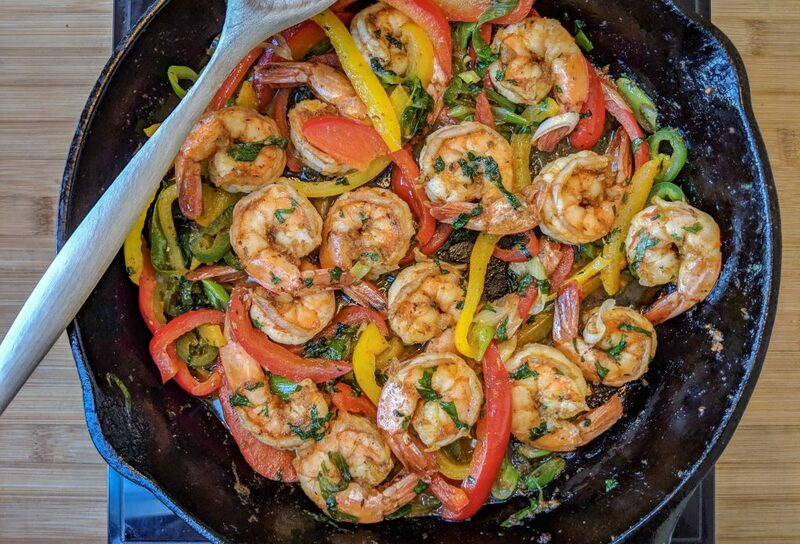 If you are a fan of mushy veggies…I know there’s a few of you out there then I would recommend cooking you veggies first, removing them from the pan then cooking the shrimp all the way before adding the veggies back in and finishing the recipe. Either way you prefer the flavor of this recipe will have your mouth salivating. Sure is! Tequila is actually one of my favorite spirits to cook with because it adds the perfect amount of flavor without overpowering the dish. Tequila is actually the only spirit that is a stimulant and not a depressant. A few recent studies have actually show that tequila could help with weight loss and metabolism but I’m no scientist so take that information for what it’s worth. 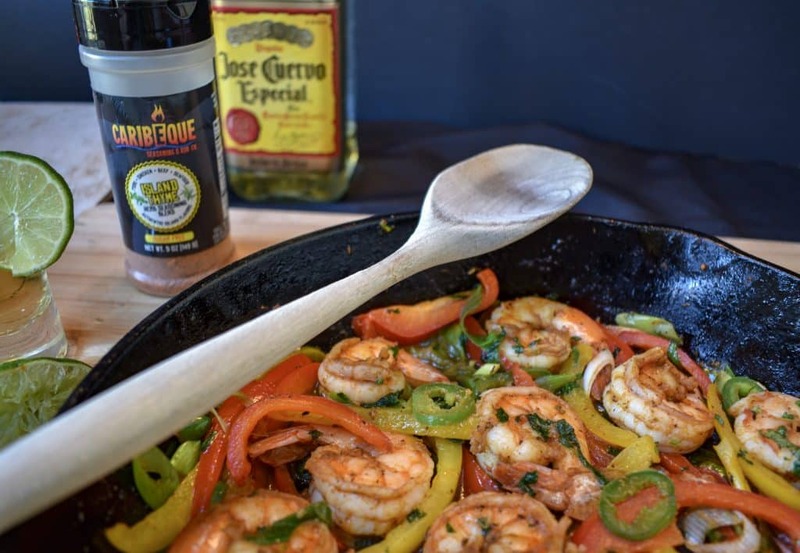 What I do know is that the combination of tequila and lime with shrimp is absolutely delicious and because your burning off almost all of the alcohol you don’t have to worry about the kids walking funny after eating dinner. If you aren’t a drinker and don’t have any tequila in the house feel free to just substitute a shot of chicken or vegetable broth. As far as what type of tequila to use I would only suggest using something you would actually drink. Gold or silver, both will work great and I wouldn’t recommend you use your most prized bottle of reposado but since we are reducing the tequila using a low quality bottle that only a frat boy would drink isn’t a good idea. I don’t like seafood, can I substitute chicken??? Well of course, this is your dinner and you should use whatever protein you like. Chicken, pork or steak would all be outstanding substitutes in this dish. Just thinly slice whichever meat you choose so it cooks quickly and you can still get a good sear. If you wanted to keep this dairy free you can substitute the butter with olive or avocado oil. Speaking of avocado, slicing some fresh avocado and serving it on the side with some sour cream and salsa would be fantastic. I’ve actually used this dish as a topping for a taco salad that is amazing. Another idea is to make crispy cheese taco shells as a tasty vessel to get shrimp from plate to mouth seamlessly. If you don’t have Caribeque Island Thyme Seasoning and want to check out their products I do have a promo code that will get you 15% of your purchase. Just use the code: LION15 at checkout. 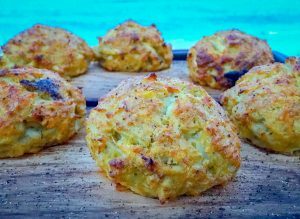 Hope you decide to to give this quick and tasty low carb recipe a try. 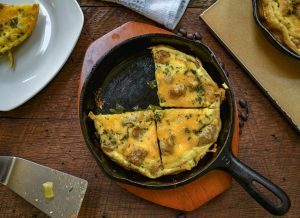 Not only is it delicious and easy to make in no time but it’s also a great keto meal prep dish if you pair it with riced cauliflower or as part of a low carb Taco Salad. As always if you have any questions or comments you can leave me a message below! Add shrimp to a steaming hot pan with 2 tablespoons of butter. Cooke shrimp for about one minute until shrimp start to turn pink on the sides. Flip the shrimp then add bell peppers and jalapeños. stir shrimp and peppers after about 30 seconds. once shrimp are fully cooked turn off heat then fold in the scallions and cilantro, finally stir in a tablespoon of butter.